Meat has gained reputation for being the cause of chronic and fatal health issues including heart disease, obesity, cancer, and others due to its cholesterol and saturated fat content. But the stance on this is changing. Lately we’ve seen a number of news reports which are beginning to clear cholesterol as a culprit of heart and other degenerative disease. Read these articles from CBS, Washington Post, Forbes, L.A. Times, and the New York Times. Although some sources continue to push the idea that saturated fat is still harmful – which is a contradiction given that cholesterol and saturated fat are typically found together in food – the fact that cholesterol and fat are vital to every aspect of health is finally starting to be understood and acknowledged. Not only are cholesterol and saturated fat essential to health, but the source of that food is also critical. It’s so important, in fact, I’ll spend a fair amount of time talking about it in this article. I’d also like to provide a review of a book, Tender Grassfed Meat by my friend Stanley Fishman (via Amazon affiliation). The book is intended to familiarize those interested with cooking grassfed meat on the nutritional and taste benefits of grassfed meat, as well as recommendations and recipes about how to prepare it for the optimal meal experience. First, I’d like to share an important video from Joel Salatin from Polyface Farms in Swoope, VI who explains how cattle are meant to live, and why what they eat affects their health and the meat they produce. I will also share my own experience avoiding meat for a good part of my life and what happened when I started eating it again (this time, real meat). We’ll then move into Stanley Fishman’s book and why animal foods from healthy sources are vital to human health. For many years, I believed eating red meat was an unhealthy choice. I heard comments from doctors, commercials, friends, and read in literature that consuming too much red meat was harmful because of saturated fat, and that too much saturated fat would lead to heart disease, obesity, high blood pressure, even cancer. I heard stories of people who had several pounds of “putrefied, rotting meat” in their colon and were now dying of cancer. When I was growing up I didn’t worry much about this. After all, I didn’t know any kids dying of these diseases. But I never liked red meat very much anyway. It always seemed tough and lacking in flavor. I was much happier when I could eat chicken or pork. I’d be satisfied enough if the red meat I was eating was disguised somehow, such as in spaghetti and meatballs or tacos. It wasn’t until a little over a decade ago that I started hearing about the benefits of grassfed meats. At first it didn’t quite make sense, but since I was beginning to understand the importance of how what we eat affects our health, I wanted to give it a try. I don’t recall the precise date when I ate my first grassfed meat. But, I do know that since then, eating beef has been something I have enjoyed a great deal. Since I love food, that’s important! As time went on, I realized that the reason I didn’t really ever enjoy meat much was because all I had probably ever eaten was the conventional variety, which in my opinion, has an objectionable taste and texture. When I discovered real meat, my food choices began to open up and I became a much more satisfied eater, not to mention, my health began to improve. I also noticed that I wasn’t hungry all the time and I was satiated after eating meals. I was actually able to eat less meat and stay full longer! Of course, I was eating other healthy foods too, but I credit my recovery from life-long health issues with eating real food, including grassfed meats. In Stanley Fishman’s informative book, Tender Grassfed Meat, he shares his experience cooking meat and not getting the results he wanted. He also discusses the reasons why people may have had negative experiences eating meat, and describes his research reading various literature – cookbooks, history books, and others – to understand how to cook grassfed meat properly, not only to maximize flavor and enjoyment of meat but also to place emphasis on maximum nutritional benefit. This well-written reference and cookbook about healthy, real meat will change not only the way you think about meat, but change how you cook meat to make flavorful and nutritious meals for yourself and your family. Conventional, feedlot beef – cattle may or may not be on pasture, but most of their lives are spent on dirt which is covered in feces. The animals are given growth hormones and antibiotics (whether they are sick or not as a “precaution”) to promote rapid growth, and they are fed grain, soy, corn, and silage (which can contain any manner of unnatural, toxic substances) for the bulk of their lives. Cattle are ruminants, and as such do not have the digestive ability to properly absorb these substances fed to them. As a result, they become sick and overweight. Their digestive tracts become very acidic and it is very common for their bodies to regularly harbor a pathogenic variety of E.coli bacteria, which is widely talked about in health news reports. Grain-finished, hormone-free, antibiotic free – you can actually find many grain-finished meats on the market which are organic. But raising cattle this way creates a watery meat which shrinks a lot in cooking. These animals may even spend some of their time on pasture, but they are sent to a feedlot for finishing and then receive grain, corn, soy, or silage to “fatten” them up quickly before slaughter. Although this variety of meat is better than conventional beef, it still lacks in nutritional profile and quality. Grass-fed – animals are on pasture from start to finish, and is usually free from antibiotics, hormones, and other chemicals (as always, getting to know your farmer and learning about farming practices is key). Fat content of grassfed meat is vastly different from conventional and grain-fed. It contains a high amount of CLA (conjugated linoleic acid) which is critical for cardiovascular health, Omega 3s, and Vitamins A, D, E, and K from being out in the open pasture, eating grass from healthy soil, and in the sunshine. As a result of animals being raised strictly on pasture their entire lives, consumption of grass-fed meat from healthy animals actually counters disease and illness – cancer, heart disease, thyroid issues, and high blood pressure. This food strengthens the immune system, increases metabolic activity in the body, can help reduce body fat and increase muscle mass. According to Mother Earth News, grassfed meat is truly more sustainable and healthier to eat. When you talk about meat from grassfed animals versus meat from conventional sources, there is simply no comparison. The nutritional profile varies vastly. Grassfed is superior in nutrient content – Vitamin A, D, E, K, beta-carotene, and Omega 3s, and antioxidants, does not contain hormones, or antibiotics. Always check with the farmer to make sure there are no chemicals or pesticides being used on the land where the animals are grazing (or anywhere else for that matter). Although the term “grassfed” does not guarantee these substances are not used, generally speaking, many grassfed farmers are mindful of avoiding antibiotics, hormones, and herbicide or pesticide spraying on lands where animals graze. Another benefit of Omega-3s is that they may reduce cancer risk. In animal studies, these essential fats have slowed the growth of a wide array of cancers and also kept them from spreading. Although the human research is in its infancy, researchers have shown that Omega-3s can slow or even reverse the extreme weight loss that accompanies advanced cancer and also hasten recovery from surgery. The majority of artificial fats are abundant in Omega 6s, and much lower in Omega 3s, producing foods that are not only indigestible but off balance from what nature creates in healthful foods. Our bodies cannot manufacture Omega 6s and Omega 3s, and must obtain these from an outside source. While it’s true that seafood is one of the best sources of Omega 3s, meat, dairy, and eggs from animals and birds on pasture is also a rich source of this important, essential fatty acid. A study conducted by North Dakota State University found the nutritional differences between grassfed and grain fed-bison to be markedly noticeable: grassfed bison had Omega 6 to Omega 3 ratios of 4.0 to one, while the grain-fed bison showed ratios of 21 to one. The University of Guelph, Guelph, Ontario, Canada discovered the impact of grazing or forage as compared to grain-feeding on the fatty acid composition of cattle. Animals consuming grain for 120 days (40 fewer days than typical feedlot cattle) had Omega 6 to 3 ratios of 11:1. Those animals eating alfalfa hay had Omega 6 to 3 ratios of 3:1. The longer cattle consume grain in their diets, the more pronounced the imbalance of essential fatty acids becomes. Cattle on a feedlot eating grain for 200 days show an Omega 6 to 3 ratios that are over 20:1. In the United States, many cattle processed for meat consume grain for 200 days or more. The Journal of Animal Science reported in 2000 that beef originating from grain-fed cattle could have an Omega 6 and 3 ratio exceeding 20:1. I’m a vegetarian/vegan for health reasons. An increasing number of those eating a plant-based diet experience a chronic health issues. Some can be related to receiving inadequate nutrients from their diets. I’ve talked with people throughout my life who are vegetarian or vegan complain of fatigue, anemia, irritability, insomnia, weight problems, cavities, heart and circulatory issues, depression, thyroid problems, and other issues. Conventional health advice which suggests consumers and patients avoid meat has direct connections to big agribusiness and food companies who profit from sales of these types of foods. When you support local farmers who treat their animals humanely, you are supporting the most important aspect of our food supply, the health of yourself, the animals, the environment, and the economy. Vegetarian diets can be healthy if they include foods from healthy birds and animals such as raw milk, butter, cheese, and cultured foods (as well as olive oil and coconut oil), and seafood which is very high in important nutrients. However, it takes careful planning and attention to the right sources and inclusion of enough healthy fats to adequately maintain a healthy vegetarian diet, something that a lot of people have difficulty achieving. The exclusion of most or all animal products can be a detriment to health as it is difficult to obtain the same level of nutrients from plants, grains, and legumes, as well as many of those foods contain anti-nutrients (phytic acid and others) which can make it difficult for the body to digest and absorb, without proper preparation methods (soaking, sprouting, fermenting), or consuming them with healthy fats which contain fat-soluble vitamins A, D, E, and K2 such as butter, olive oil, or lard and tallow. One example of a critical nutrient that is obtained from animal and bird foods is Vitamin A (retinol), which is much more easily digested and metabolized than from the beta carotene form of Vitamin A found in plant sources (often due to the nutrient-inhibitors in vegetables and the need to also consume fat-soluble vitamins with them for proper digestion). Vitamin D is another significant nutrient that is difficult to obtain in anything other than minimal amounts of from plant sources, and Vitamin D is responsible for so many important factors in health – anti-cancer (reduction of free-radical development on the cellular level), immune system maintenance, fertility and development of embryos in the womb, protection from osteoporosis, cardiovascular health, and neuromuscular and joint function, just to name a few. Vitamin B12 is another vital nutrient that is not found in plant foods. Vegans who fail to supplement B12 in their diets can easily fall susceptible to anemia and long-term damage to nervous and digestive systems. Claims made in literature which supports a plant-based diet state that B12 is found in tempeh (fermented soy), and in specific types of algae, and Brewer’s yeast. These are untrue claims, as there are no bio-available sources of B12 found in plant foods. Read more from The Weston A. Price Foundation in Myths of Vegetariansim (see Myth #2). Plant-based diets fall short of critical nutrients. The body needs Vitamin B12 and essential omega-3 and omega-6 fatty acids that can be satisfied by eating fish and other seafood. Strict plant-based diets can cause the development of Vitamin B12 deficiencies. Modern dietary recommendations suggest consuming “fortified” foods including bread, fat-free milk, orange juice, cereals, and other processed products which contain synthetic nutrients. Synthetic nutrients are difficult for our bodies to identify and are not well-absorbed. In addition, an overdose of synthetic nutrients like Vitamin A or D can be even more detrimental to health. Vitamin B12 deficiency can result in anemia and nervous system damage. Low levels of Vitamin B12 also increase the risk of heart disease or pregnancy complications. More information on why grassfed meat is a health food: Red Meat, Bane or Boon, interview with Dr. James Carlson, M.D., a board-certified family physician and clinical biochemist with 20 years of experience treating people with obesity, heart disease, diabetes, and cancer. He is the author of the book Genocide: How Your Doctor’s Dietary Ignorance Will Kill You, recommended via Amazon affiliation. I don’t want to hurt animals/birds or to make them suffer. I definitely don’t support any farming practice that promotes or institutes abuse, neglect, or mistreats any animal or bird to produce a product. That’s why I support grassfed and pasture-raised farming that employs humane treatment of all animals and birds: allowing animals to be out in the open and on pasture where they belong. In my opinion, anything except those conditions constitutes abuse and neglect, and should be considered unhealthy and inhumane. That includes the support of agricultural crops like soybeans, corn, and other grains like wheat which are fed to factory-farmed animals and birds. If you buy these products, you are directly supporting the continuance of these industries. Many people view death as a negative aspect of life, but it’s all part of the cycle of how we were meant to live on Earth. Animals are not meant to spend their lives on feedlots eating artificial substances laced with pesticides, herbicides, chemical fertilizers, and from genetically-modified feed. It’s simply not natural. I also believe that by eating animals raised humanely, we are following in the footsteps of those who came before us, and recognizing our omnivorous genetics. Humans have eaten animals for thousands of thousands and years, and to the credit of of our health. Our digestive systems are short in design like many other predators, not long, like many herbivorous creatures. Our teeth are also designed for cutting and chewing meat. It hasn’t been until the last 70 or 80 years that degenerative problems like heart disease and cancer have become such an epidemic as they have in modern times, coinciding with the fairly recent trends of recommendations to avoid meat and consume more plants, grains, corn, and soy. Read more on the findings of Dr. Weston A. Price and the principles of traditional diets which supported robust health from those who came before us: our ancestors. I can get adequate nutrition from meat substitutes. Let’s review what substitutes are commonly used in place of meat: soy, beans and other legumes, grains, and nuts. Soy can actually be one of the most unhealthy substances to consume – especially in the form consumed in developed countries: highly processed, frequent consumption, and mass-produced. Most soy products on the market are some of most toxic substances you can eat. Traditional populations in Asia and other regions who consumed soy did so in very small amounts, and in its fermented form. This process of preparing fermented soy is not at all the same as how we consume soy in modern times. Soy contains phytic acid, a nutrient inhibitor that unless properly prepared (fermented) causes nutrient loss in the body. Unless fermented, soy protein is a substance that is not digestible or useful to the human body. Read more from The Weston A. Price Foundation. For more information on how industrial soy became heralded as a health food and has caused chronic disease, read Kaayla T. Daniel’s book The Whole Soy Story, recommended via Amazon affiliation. Grains, legumes, and nuts can also pose problems. These foods also contain phytic acid, unless the foods are soaked, sprouted, or fermented, and as such also result in the body losing nutrients when they are eaten. Have you ever wondered why there is such a proliferation of allergies and sensitivities to wheat, grain, and nuts? One reason is because our food supply is replete with grains that are packaged and processed for convenience, not health. They are also readily available for people to eat everywhere. Eating too many of these foods that are not traditionally prepared contributes to obesity, heart disease, auto-immune disorders, allergies, and many other problems. The type of protein in these foods is not comparable in a nutritional sense, to that found in meats and animal foods, nor is it as digestible. Eating animals is harmful for the environment. If by harmful for the environment, you refer to the filthy, unnatural conditions cattle, pigs, sheep, chickens, and any other type of meat processed for sale on the conventional market, you are absolutely right. That’s why I don’t support those markets. I buy my meat locally from a farmer I trust and know that they treat their animals humanely and allow them to live their lives naturally, as they were intended. In sharp contrast, animals raised humanely and on pasture actually contribute to the health and sustainability of the planet, not detract from it. Sustainable farms are systems that work with nature – so in the case of beef farms, the animals graze on pasture, they trample the ground to help their manure fertilizes the land, and the animals move on to another piece of ground. Then, birds and other creatures come and remove parasites and other matter from manure that isn’t useful to the overall ecology of the land. This process is the same that mindful farmers such as Joel Salatin are using with great success to produce healthy food which allows the environment to thrive and produce more healthy food for the future.This example of animals raised humanely on pasture is what’s known as a bio-dynamic farm which is where the focus is on holistic development and the critical relationship between the soil and all its corresponding organisms, plants, animals, sun, air, and water. It is a self-sustaining and self-nourishing system. It has all it needs. Nothing needs to be added or subtracted (such as antibiotics, hormones, pesticides, herbicides, chemical fertilizers). This process is one that has been occurring in nature for thousands and thousands of years. It is an intimate part of our history and is germane to our continued existence as a species. For more information on the work of Allan Savory, visit the The Savory Institute which is helping farmers and ranchers all over the world rebuild the soil and heal the land using holistic livestock management techniques. Recommended reading: Cows Save The Planet: And Other Improbable Ways of Restoring Soil to Heal The Earth by Judith D. Schwartz via Amazon affiliation. Are you ready? Since nothing can be commented on, assumed, or decided until a fair try has been made, I challenge anyone reading this who has never tried grass-fed meat or is currently is not a meat eater for whatever reason to taste grassfed beef, just once. If you have not had experience cooking meat and don’t know how to begin, I highly recommend buying a copy of Tender Grassfed Meat. This book has some very simple recipes to make your meat dining experience nourishing and impeccable. Some who don’t eat meat say they cannot stomach it. If you have this opinion of meat, there may be digestive issues present that cause issues in digestion of meat. Or, perhaps you have not ever eaten properly-prepared grassfed meat. If I had never eaten grassfed meat, I would have probably continued to avoid red meat for the remainder of my life because I find it to be unpalatable (as well as unhealthy). Once you taste it and have experienced the difference, it’s very possible you may have a change of heart. You might be reading this and thinking, “I don’t eat meat, I’m not going to just get up tomorrow and start doing it out of the blue just because you said so.” Maybe that is due to the fact that you have principles about your beliefs or simply that you feel as though you couldn’t actually, physically consume an entire piece of meat for a meal because of taste/texture, etc. Whatever the case, know that some vegan and vegetarians have become omnivores for the first time or again after many years absence because of factors such as failing health and the realization that there is really no comparison between factory-farmed meat and real, grassfed meat. Stanley Fishman, author of Tender Grassfed Meat and the web site, Tender Grassfed Meat has a great post about the Mediterranean Diet, Call It Medical, Not Mediterranean. As discussed in the beginning of this article, conventional medical and health professionals place an emphasis on low-fat diets that recommends avoiding meat and includes more legumes, fruits, grains, and vegetables. A common claim is that this diet is line with the traditional Mediterranean diet, which posits that those living in this region consumed very little meat and meat products, favored canola and olive oil almost exclusively for their dietary fat intake, and ate many servings of vegetables daily. The real Mediterranean Diet actually does consist of animal foods and meat products, which contribute to health and well-being. Another informative article by Chris Masterjohn, Vegetarianism and Nutrient Deficiencies, explains the science behind important nutrients in foods, where they come from, and how best they are assimilated into the human body. It also has a comparison between the nutrient quantities found in plant versus animal foods. Nutrient Showdown, from Nourished Kitchen, provides an in-depth look at various foods, comparing the plant-based nutrients to those found in animal foods. The difference is not only staggering, but surprising given what modern medical recommendations have to say about health and nutrition. Remember…just because the majority of the population that consumes meat feasts on toxic meat of inhumanely treated animals and birds who are administered antibiotics, hormones, and other toxic chemicals is not justification to stop eating real meat from humanely-raised animals and birds on pasture. By supporting sustainable farms in your local area who raise healthy, happy animals, you can help put an end to the cycle of suffering, waste, pollution, and damage to health and the environment caused by factory farms. This is a choice for true sustainability. 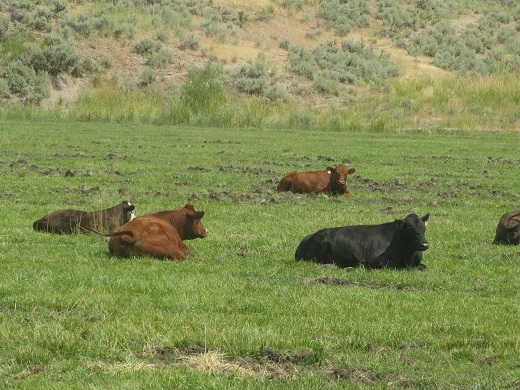 Photo credit: Raine Saunders, Wilsey Ranch, Idaho. Hi Linda – thank you for your comment! I appreciate your support, and thank you for all you do and write about on your own beautiful blog! What a great post, Raine. I appreciate you pointing out that vegan folks who consume soy, corn and wheat are promoting an egregious system that furthers the suffering of animals. I also appreciate the links you give and the book references. I’d like to follow through and read these. Pinning. Thanks for your hard work and all you shared. BTW, watched the Salatin video with my to-be-6-year-old. He sat quietly watching the whole time until after one particularly poignant comment about transforming carbon through grass farming he said, “Cool!” and looked at me with excitement. SO cute. He was tracking the whole time and “got” it. Lovely. I love this for so many reasons. As a 2 year vegetarian who knows and witnesses the importance of meat, but respectful of the sacrifice…this is a great article.